The St. Petersburg Piano Quartet. Mozart may not have written the very first piano quartet, being preceded in a way by J. C. Bach, Schobert and others, but he definitely was the first to write piano quartets in which all the voices are equal, and the indicated keyboard instrument is a pianoforte in the modern sense. In 1785, Mozart received a commission from the Viennese publisher Hoffmeister for three of them; however, when he submitted the first one, in G minor (K. 478), Hoffmeister was unhappy over its difficulty for amateurs and cancelled the other two but as a friend of the composer allowed him to keep the entire commission. When he completed the second, in E-flat, K. 493, Mozart offered it to another publisher in Vienna, Diabelli. Of the two, it is both less technically challenging and more amiable in style. It also opened the program Tuesday by the St. Petersburg Piano Quartet that was the final offering of this season’s chamber music concerts at the Flagler Museum. The event was advertised as sold out, and I did not see many empty chairs in the Museum’s Music Room. Violinist Alla Aranovskaya and violist Boris Vayner, alumni of the original Russian string quartet, have been joined by cellist Thomas Mesa, who won first prize at last year’s Sphinx Competition, and pianist Tao Lin, on the faculty of the Lynn Conservatory in Boca Raton. The personnel have thus shifted their geographic center closer to the city on the Gulf of Mexico from its namesake on the River Neva. Mozart’s E-flat Piano Quartet was completed shortly after his opera, Le nozze di Figaro, and has something of the lightheartedness of that work, although a tinge of melancholy is suggested by a passage in minor that occurs in the rondo finale, Allegretto. The players were well-balanced throughout. Despite the beautiful sound of the Museum’s Steinway A, it often seemed a little too prominent in the foursome, although the bright room acoustics may have been chiefly responsible. If the strings had brought more gaiety to their cultivated ensemble tone, the reading would have profited. In the 19th century, the piano quartet attracted several composers who produced some of the finest works in that form. Mendelssohn wrote three but they are juvenilia; Schumann contributed one in 1842; but it was his young friend, Johannes Brahms, who composed three of the great piano quartets. 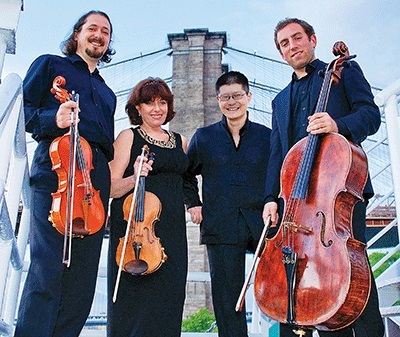 Highlights of the St. Petersburg Piano Quartet’s performance included Lin’s coaxing beautiful fundamental tones from the vintage piano, and viola and cello solos by Vayner and Mesa, respectively. Mesa was featured in the encore, the Andante cantabile third movement of Schumann’s Piano Quartet in E-flat (Op. 47), which features an ardent cello solo that many will remember from the Australian film of several decades ago, My Brilliant Career.